Liberal High School will welcome their state champions Thursday and Friday. The LHS Soccer team will be recognized for their State Championship by Pizza Hut at their south store location on Pancake Blvd, Thursday, November 10th from 6:30-8:30 p.m.
LHS will honor the LHS Soccer team in the auditorium on Friday, November 11 @ 2:55 p.m. in front of the entire student body. Audio and Video highlights of the playoff and championship run will be part of the celebration, along with the introduction of coaches and players. 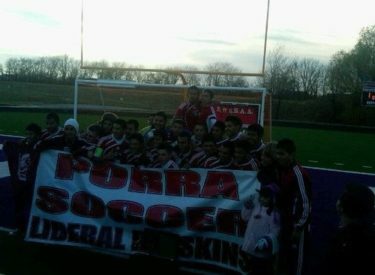 The Redskins won their first state soccer championship Saturday 3-1 over Blue Valley at Kansas City Piper High School. Liberal won their last 12 games to finish 16-5.